Lovely Musical Sculptures and Music Boxes for Kids. For half a century, Rudolph the Red-Nosed ReindeerÂ® has delighted young and old alike with its enduring themes of love, friendship, acceptance and triumph over adversity. Now, RudolphÂ® leads Santa's reindeer once more with a sculpture honoring the holiday special's 50th anniversary. Introducing the Rudolph's Christmas Journey Sculpture, a one-of-a-kind exclusively from The Bradford Exchange. This Christmas masterpiece showcases Santa Claus in a sleigh led by RudolphÂ® and joined by more favorite characters like HermeyÂ®, Sam the SnowmanÂ® and more! This lighted and musical sculpture is the perfect addition to your holiday decoration, expertly hand-cast and hand-painted in vibrant color and charming detail. Gleaming with golden accents and glowing with 20 festive LED lights, Santa's fully sculpted, bright red sleigh includes a team of 8 reindeer plus 10 beloved characters from the holiday special. Rudolph's nose lights up too, and the melody of "Rudolph the Red-Nosed Reindeer" plays at the touch of a switch! A glittery snow-covered base with a title plaque adds the final flourish to this remarkable presentation. Given the popularity of the Rudolph the Red-Nosed Reindeer holiday special, this officially licensed sculpture is expected to draw widespread demand. The edition is limited to 120 casting days, so hurry. Order now! Elsa enchanted audiences worldwide in Disney's "Frozen". Now, Elsa sparkles in the Disney FROZEN Let It Go Music Box, available from The Bradford Exchange. This Disney-licensed FROZEN collectible music box brings the magic of "Frozen" to life as it plays the award-winning version of Idina Menzel's "Let It Go"!Handcrafted of Heirloom PorcelainÂ®, this FROZEN music box is lavished with platinum, simulated gems and glittery accents. Best of all, it features a sculptural Elsa on the lid standing before illuminating crystalline castle! This FROZEN music box makes a perfect gift for "Frozen" fans and is a must-have FROZEN collectible for your collection. Strong demand is anticipated, and the edition is limited to only 95 firing days. Don't delay - order now! A fine collectible, not intended for small children. The wonderful tale of Rudolph the Red-Nosed ReindeerÂ® has captivated the hearts of children everywhere for half a century with its sentimental story, stop-motion animation magic and sweet songs. 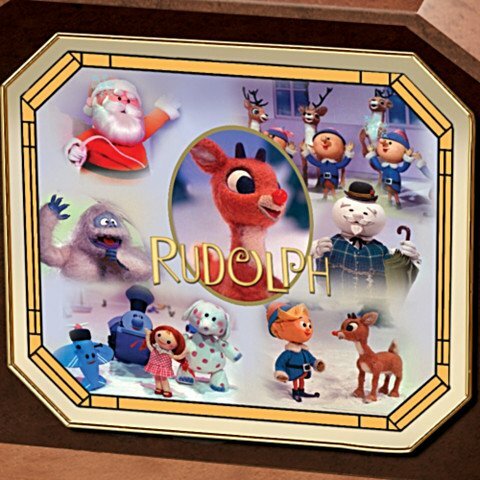 Now, you can capture the fun and excitement of the longest-running holiday special in a 50-year celebration of this beloved story with the Rudolph the Red-Nosed Reindeer Music Box, an officially licensed, first-ever limited edition only from The Bradford Exchange. This fine, heirloom-quality music box is exquisitely handcrafted with a rich mahogany finish in the elite artistic traditions of Rhodes Studios for enduring collectibility. An intricately sculpted North Pole scene, complete with Christmas tree, is tucked inside this enchanting musical keepsake.Look closely and you'll find all your favorite characters in the scene - RudolphÂ®, ClariceÂ®, Sam the SnowmanÂ®, Yukon CorneliusÂ®, Abominable Snow MonsterÂ® and, of course, HermeyÂ® the elf - all fully sculpted and hand-painted in festive holiday colors. Character artwork within a stained-glass-looking frame brightens the underside of the music box lid. Turn the key and you'll be transported back in time as the music box plays the signature melody "Rudolph the Red-Nosed Reindeer". As a distinctive finishing touch, the front of the music box is graced with a golden "Rudolph the Red-Nosed Reindeer" name plaque. Strong demand is expected for this 50th anniversary tribute to this beloved holiday classic. So, don't delay, order now! Standing fireside and filled with devotion, Olaf knew the meaning of true love: "Some people are worth melting for". Now, express your love for someone special with the Disney FROZEN You Melt My Heart Music Box, available from The Bradford Exchange. This Disney-licensed FROZEN Olaf music box will surely delight every time it plays the sweet melody of "Do You Want To Build a Snowman"! Handcrafted of beautiful Heirloom PorcelainÂ®, this Disney FROZEN music box captures Olaf in a heartwarming pose as he holds a 22K gold-plated heart that proclaims "You Melt My Heart". This Limoges-style music box opens on a silver-plated hinge and makes a perfect gift for "Frozen" fans. Strong demand is anticipated for this Disney FROZEN music box, and the edition is limited to only 95 firing days, so don't delay. Order now! A fine collectible, not intended for small children. Award-winning artist Sandra Kuck is well known for her outstanding ability to capture the special relationship between siblings. Now her portrait of a loving sister's helpfulness graces the new "My Sister, My Friend" handcrafted porcelain music box that plays "Memories".What a wonderful way to let your sister know how much you care. Think of her reaction when she opens your lovely gift and sees the beautiful artwork, sparkling crystals and simulated gems and 22K-gold accents. Inscription on the back reads "There is No Friend, Like a Sister, And No Sister Quite Like You" in golden script for the perfect finishing touch. Edition is limited so don't wait, order now! The longest-running holiday special in television history, Rudolph the Red-Nosed ReindeerÂ® has been a cherished part of holiday traditions since it first aired in 1964. Recapture the magic of this timeless holiday classic with the Rudolph the Red-Nosed Reindeer snowglobe, a first-ever exclusively from The Bradford Exchange. 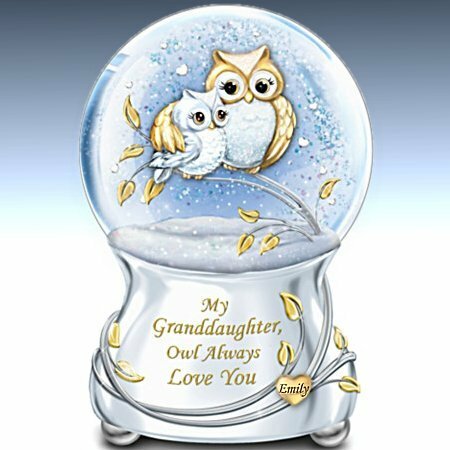 This RudolphÂ® snowglobe features many of your favorite Rudolph the Red-Nosed Reindeer characters like HermeyÂ®, BumbleÂ®, Sam the SnowmanÂ®, ClariceÂ® and more all masterfully hand-cast and hand-painted in vivid details and vibrant colors. Glittery snow continuously blows while Santa's castle, the lamppost and tree, even Rudolph's nose illuminate at the flip of a switch! Plus, the beloved melody of "Rudolph the Red-Nosed ReindeerÂ®" song plays at the volume of your choice. High demand is expected for this limited-edition collectible masterpiece. Order now! The wondrous spirit of the holiday season takes many forms: a snowman's jolly smile, a glowing Thomas Kinkade Christmas painting, perfectly wrapped gifts beneath the tree, the clatter of reindeer up on the rooftop, and now this sparkling crystal snowman! Introducing the Thomas Kinkade the Gift of the Holidays Sculpture, a dazzling illuminated and musical treasure exclusively from The Bradford Exchange. With its softly glowing light and cheerful repertoire of Christmas songs, it's the perfect way to make the radiant artistry of Thomas Kinkade a special part of your holiday celebrations.A Christmas decoration that is sure to take center stage in any room, this limited-edition crystal snowman is individually handcrafted of multi-faceted genuine crystal and finely sculpted artist's resin. 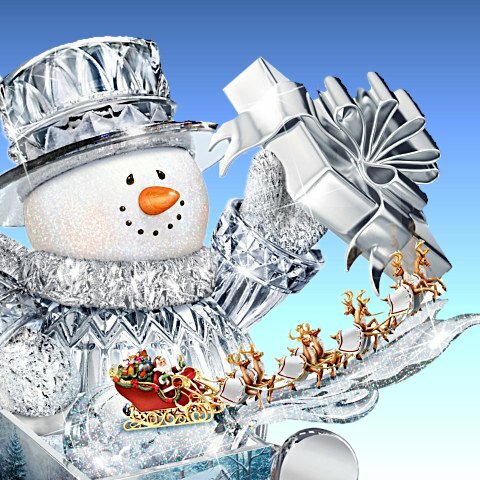 A gleaming silver luster adorns the snowman's mittens, scarf and shoes, as well as the gift box top with its festive bow. And what a surprise waits inside! Rising on a sparkling crystalline trail of holiday magic, a hand-painted sculpture of Santa and his sleigh takes off for its appointed Christmas Eve rounds, while a medley of 8 beloved Christmas carols fills the air. Even the gift box is a joy to behold, glowing with light from within and showcasing one of Thomas Kinkade's most beloved holiday artworks. Strong demand is expected for this premiere Thomas Kinkade crystal snowman, so don't wait. Order now! Celebrate the 80th anniversary of Disney's "Snow White and the Seven Dwarfs!" Remember the journey through the forest, into the Dwarfs' cottage, and even down into their diamond mine? Now the adventure continues in this very special Collector's Edition, the Disney Snow White Hidden Treasure Cuckoo Clock, a design original from The Bradford Exchange. At nearly 1-1/2 feet high, this illuminated cuckoo clock is a triumph of the sculptor's art. Showcasing not only the dwarfs' cottage and the forest, but also their diamond mine, it stars Snow White, the Evil Queen in her Old Hag form, and all seven of the dwarfs - brought to life with lights, music and motion! What a magical wonder! Handcrafted in artist's resin and hand-painted, each location is depicted in remarkable detail. The front of the cottage features the clock face and provides the perfect backdrop for Snow White and Dopey, while the Evil Queen in her Old Hag form beckons with a poison apple from one of the cottage windows. Down below, Happy, Sleepy, Bashful, and Sneezy work in the diamond mine, while Doc and Grumpy swing on the decorative pickaxe weights that flank the clock's pendulum (adorned with the film's official logo, of course). But there's more to discover! On the hour, the cottage windows and the "diamonds" in the mine light up and the dwarfs take a ride through their mine to an iconic melody from the movie! Don't wait to bring home this must-have Disney collectible - the edition is limited to 295 casting days, and strong demand is expected. Order now!